The above video clip lets you hear three of the effects you can get with TAAG! 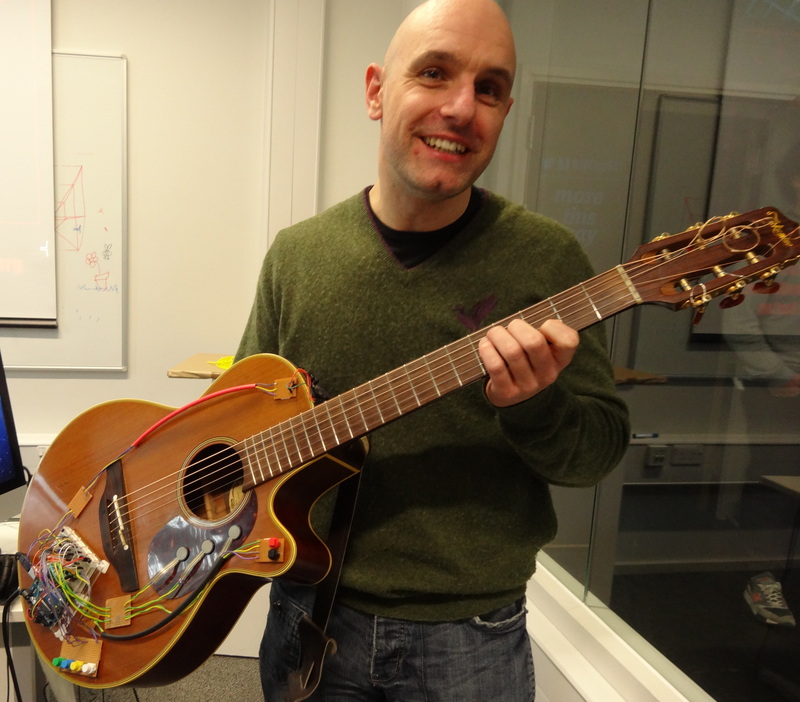 So let me present The Augmented Acoustic Guitar, created as the final project of the Interactive Digital Media Techniques module, part of the Media, Arts and Technology PhD programme at QMUL in London. 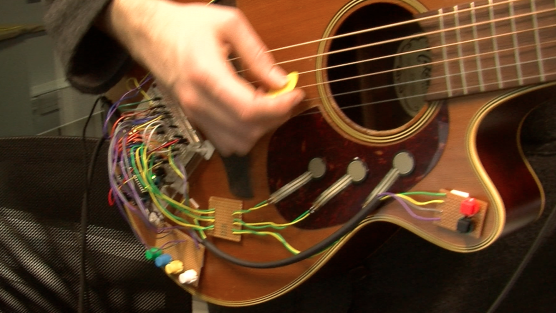 For this project I grabbed my Takamine guitar and stuck an Arduino on it and together with 3 Force Sensitive Resistors, a Force Sensitive Potential Divider and a couple of buttons, it allows you to control audio effects while you strum away. The initial effects chosen were EQ, Delay, Wah, Chorus and Overdrive. Control a simple high, middle and low EQ by applying pressure on the three pads at the front of the guitar. Tap in the delay time using one of the pads or chose Overdrive, which is applied by pressure of the thumb on the sensor on the neck. 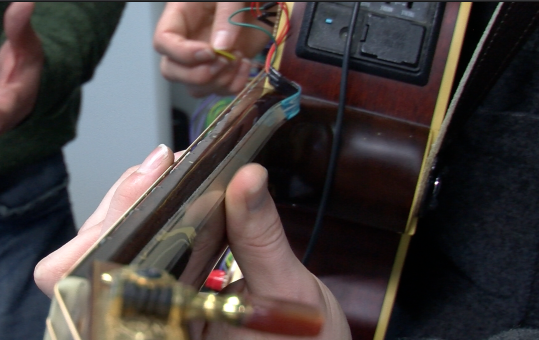 Get a Wah sweep by running your thumb or a finger up and down the sensor on the neck of the guitar. 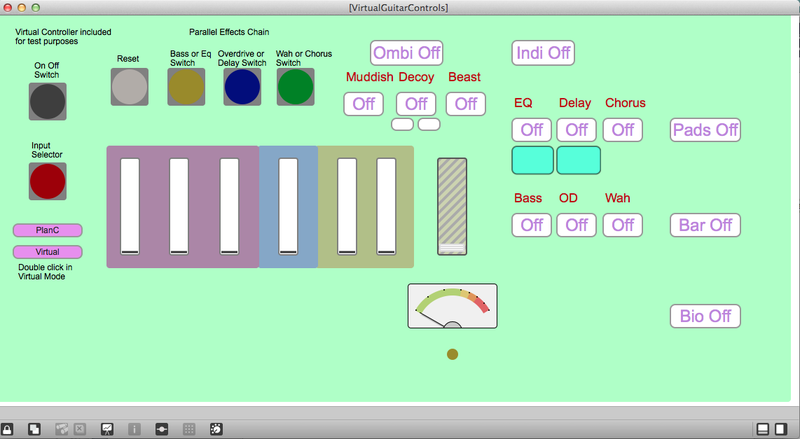 You can even set the oscillation depth and rate for the Chorus using two of the pressure pads. You can see effects titled Muddish, Decoy and Beast are also available. These are specifically designed effects using combinations of the others and some cutting edge technology developed here at QM. You can use Muddish when moving from rhythm to lead guitar and it is applied using the thumb on the sensor bar at the back. When engaged overdrive is applied to the signal along with an EQ boost at frequencies relative to neck position. Flick your finger on the middle pad gives a bonus Wah sweep! So you can super swiftly add and remove a delay the Decoy effect was developed. Quick use of the thumb adds or removes delay at the player’s whim; get the notes repeating and avoid the chords. The hidden tech in this patch allows the delay to be proportional to the tempo you’re playing! Using the pads you can chose delay times between half, quarter and eighth notes. You can always switch back to tapping in if you like. Needing to be a one-man-band? Well the first step is the Beast! Turn this on and you get an algorithmically calculated bass line. Every beat the system estimates the chord and pumps out the root note – if it makes a mistake the result is more likely to be the 3rd or the 5th.